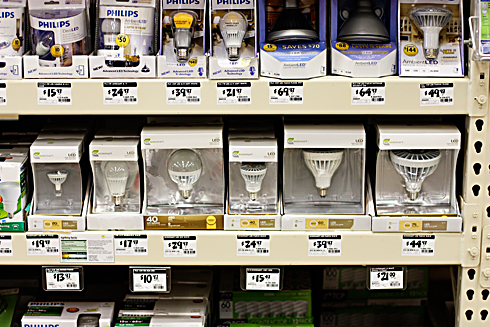 With prices approaching affordable, LED lighting is finally becoming mainstream. Recently, we’ve tested 3 different brands of 5-6 watt, LED MR16 lamps. They range in price from $12 to $20 each, and have a life span of 20,000-30,000 hours. We’ve done the math, and if used about 40 hours/week, this can be well over a decade of illumination. In comparison to the LED options, MR16 halogen bulbs (20 and 35 watt) cost around $5 each. They last about 5000 hours (if you are lucky), and have around 250-300 lumens. In our office environment, the LED bulbs appear slightly brighter than the 20 watt 250 lumen halogen lamps. Beyond brightness, if the color of light is a concern, the LED’s are available in 3000k (Kelvin degree) warm white or cool white options. Typically, lower k temps mean a warmer color of light. But we found while halogen bulbs can be anywhere between 2800k to 3200k, they do appear slightly warmer than the LED’s in color, no matter the source. There are two main factors to consider when comparing LED, halogen, xenon, or fluorescent options: 1. Duration of use; 2. Cost of replacement. The question is how long will the lights be on each day? The more they are used, the quicker the payback in energy savings. You can expect an LED lamp to last 4-6 times as long as a halogen. Keep in mind that while the purchase price of an LED bulb might be 3 times that of a halogen, an LED lamp can boast over $100 in savings over its 50,000 hour lifespan. When you add to these factors the cost and trouble of going to the store, finding the right bulbs, and replacing them; the decision in favor of the LED bulb seems fairly simple. But other options, such as undercabinet lighting or recessed lighting could introduce variables that would sway your preference. This winter, thinking about efficiency and life span, I purchased LED undercabinet lighting from a MABA member (previously, I had used Xenon lights but was disappointed by the inordinate number of bulbs that quickly burned out). The reflective nature of the countertops created an unexpected consequence. Polished granite, it turns out, reflected the individual dots of light. Therefore, florescent T5 undercabinet lighting, due to cost and energy use (and the fact that it does not reflect off the granite) turned out to be a winning product for this application. Compact florescent bulbs in recessed can lights are a viable option depending on your usage. LED’s currently win out in life span and energy savings, but when adding the extra cost of trim rings, and taking into account how often you use the lights, they may not be optimal for every situation. However, if you want to be able to dim the lights, the LED’s are the way to go. Candelabra-base bulbs are another challenge, but we have tested a couple of products from former MABA member EFI (Energy Federation, Inc.) as well as The Home Depot with pleasing results. While not dimmable, there are some 5, 7 and 9 watt CFL’s that provide great lumens with a color similar to that of a traditional incandescent light. For more product details, please follow the links below.